Trina Robbins, Last Girl Standing. Fantagraphics, 2017. 200 pp, $19.99. Trina Robbins is often mentioned as the token woman of the underground comix scene of the 1970s. In the standard narrative, she stands out amidst the boys club and often rails against the misogyny of the scene, highlighting how her exclusion led to the founding of Wimmen’s Comix, the underground serial anthology written for and by women. While this narrative forms a part of Robbins’s Last Girl Standing, we get more of a sense of context both for Robbins herself and for the underground comix scene. The memoir takes us through the worlds of vintage fashion, folk music, and alternative publishing amidst the haze of youth counterculture, free love, and barter economies. At the center of it all stands Robbins, the ultimate collector, bringing unexpected scenes and people together and providing a valuable cultural picture of how, for her as a woman, comics was part of a complex visual culture that intersected with posters, advertisements, and fashion. The narrative, infused with Robbins’s lively voice, while clearly the tale of an individual, calls attention to how a cultural studies lens that considers contexts beyond the comics page might help scholars recover women in the industry. One of the most compelling aspects of the book is the way Robbins’s life experience connects fashion and comics, presenting an alternative trajectory for a comics reader and maker. She begins by positioning her comics reading origin story against superhero comics, claiming “superhero comics bored me to tears and I didn’t buy them” because “there was nothing there that I could relate to” (21). Instead, she read “all the comics that featured girls or women on the cover,” such as Patsy Walker, Millie the Model, and Junior Miss, and marveled so much at the paper dolls these books included that she crafted her own paper dolls (20-21). From there she graduated to making shift dresses she sold at craft fairs, to dressing the likes of Cass Elliot and the rest of the Mamas and the Papas, to opening Broccoli, her East Village fashion boutique. In exchange for sewing for the staff, the East Village Other gave Robbins free ad space where, rather than a traditional ad, she drew a comic strip she called Broccolistrip. It was through EVO that Robbins got involved in the underground comix scene, forming an East Village community that included such well-known names as Robert Crumb, Art Spiegelman, Spain, Kim Deitch, and Roger Brand. While her subsequent exclusion in underground comix led her to question why she “left a perfectly good career in dress designing for the unwelcoming world of underground comix,” when she drew Meet Misty for Marvel’s kids-oriented Star line in the mid-1980s and California Girls for Eclipse shortly thereafter, she included paper dolls, exposing a new generation of girls to the connections between comics and fashion. Just as her origin story presents an alternative to that told by many comics fans based on Robbins’s gender, her status as a woman in the industry caused her to seek alternative publication venues once she became a cartoonist. As a budding feminist interested in Women’s Liberation, Robbins felt alienated by the misogynistic subject matter of many underground comix, and the men often excluded her because, as Spain later told her, “they wanted to be gross, violent, and disgusting” and her “comics were just too damned sweet” (153). As a result, rather than appearing in the publications normally associated with underground comix (e.g. Zap, Arcade, Fabulous Furry Freak Brothers) Robbins’s work appeared in comix tabloids, such as Gothic Blimp Works and Yellow Dog; Pro Junior, an underground publication by Kitchen Sink Press out of Milwaukee, Wisconsin; underground newspapers like the Berkeley Tribe and Good Times; and alternative magazines such as Heavy Metal and National Lampoon. She also used her power of bringing people together, an ability she had cultivated since her New York boutique and home became a gathering place where anyone was welcome, to make space for women in the underground, first through It Ain’t Me Babe, which also featured the work of Willy Mendes, Lisa Lyons, and Michelle Brand, and then through Wimmen’s Comix and Wet Satin. Those who expect the chapter on Wimmen’s Comix to be a sort of climax of Robbins’s narrative, given how often she is cited in conjunction with the publication, will be a bit disappointed by the chapter, which mainly details her side of a feud with Aline Kominsky-Crumb and Diane Noomin. 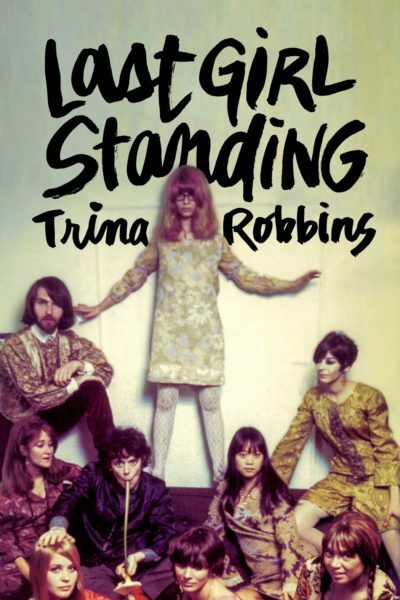 Moments like these, where Robbins refers to her “elephant list,” the list of people she never forgets who have helped or slighted her in some way, might distract some from how adeptly Robbins brings together many elements of 70s counterculture (140). As is evident from these examples, Robbins emerges from the narrative as a collector, bringing together stories, people, experiences, and media in unexpected ways. The book itself is another collection, presenting photographs of family and friends alongside the examples of the rich print culture Robbins contributed to that includes comics, ads, posters, and invitations. The writing style accompanies the illustrations in enhancing the feeling of the book as collection. Told in short, stream of consciousness vignettes, the stories and people of Robbins’s life are captured in specific moments, making paragraphs feel, in some ways, like comics panels that the reader may or may not connect to one another. While this style might be off-putting to some, it gives the memoir a conversational aura, as if Robbins is sitting down with you running through the memories she has collected over the years, wondering where people are now, and reliving the trials and triumphs of her youth. Indeed, the personal aspect of the book is both its strength and its weakness. Robbins tells an important alternative narrative of reading and making comics that calls attention to possible reasons we see few women recognized not just in the underground scene, but in the industry more broadly. But there are constant reminders that this is Robbins’s narrative and could not be anyone else’s. As a result, the memoir provides a good starting place for recovering the women of comics, making me yearn for more women to tell personal stories about their experiences. Leah Misemer is a Marion L. Brittain Postdoctoral Fellow at Georgia Institute of Technology where she uses comics to teach first year writing and science communication. A scholar of digital media, print culture, and visual rhetoric, Misemer’s primary research considers how marginalized audiences use serial comics to form communities. She is currently editing a book on cartoonist Lynda Barry for University of Mississippi Press and serves as a Member at Large for the Comics Studies Society.